Gmail themes allow you to change Gmail background wallpaper. You can either choose from featured photos suggested by Google or set your personal photos from Google drive, Google Photos or any other online photo that has a public URL. You can also upload any image from your local drive to set it as Gmail background. Also, the solid color background allows you to choose solid colors for single colored theme or dark theme. 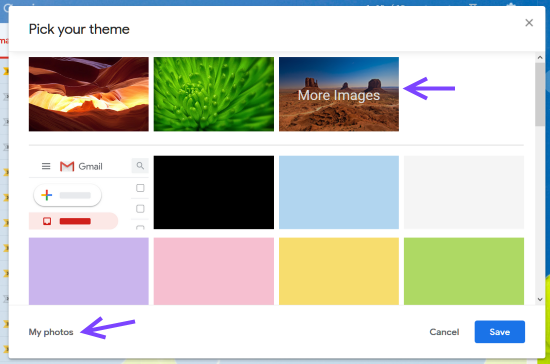 To add your custom image background to your Gmail Inbox, click on Settings icon >> select Themes. The new popup will allow you to choose from available images, solid colors and predefined themes. To find more photos to choose from, click on 'More images'. Scroll down to choose from solid colors and few other basic images. If you want to choose your own photos and images from Google Photos and Google Drive, click on 'My Photos' button at the left bottom. 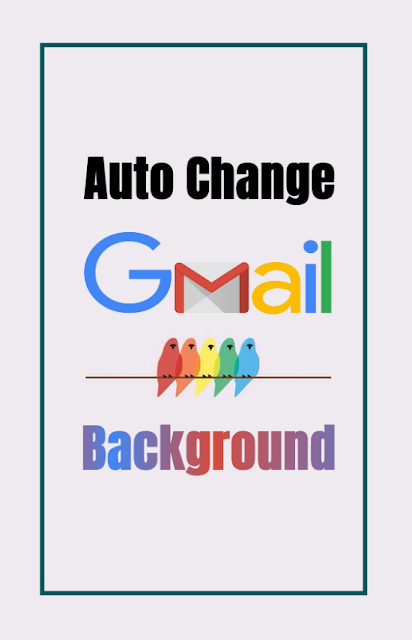 My photos allow you to choose Gmail background from photos you uploaded to your Google Photos album and Google Drive storage. You can also use images used in your Blogger blog. Once you have selected an image, you can then tweak some other display settings like 'Text background', 'Vignette', and 'Blur' settings. When you finalize the wallpaper image, the settings are displayed at bottom of the popup. If you don't like the same theme forever and want Gmail to greet you with a new theme everytime you log in, you can choose a Random Gmail theme. This will change the theme every time you open Gmail. 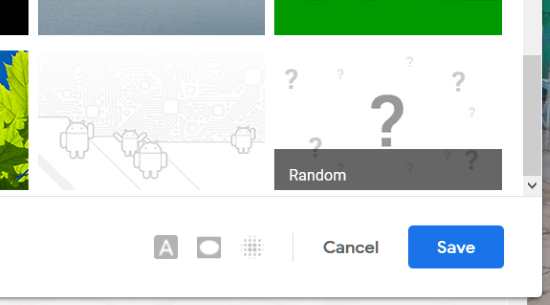 Go to Setting icon >> Theme >> Scroll to the bottom and select the wallpaper with a question mark named Random. The only thing is, you can not upload an image from your local drive. That was available previously is - I think- removed by Google. What else you do to make Gmail looks better? You are always welcome. We will keep trying to provide the best and most useful tricks. We have already said that, there is no any way to crop or re-size your images to fit it to the background nicely. You can do one thing. Download the images from standard GMail background. Find the exact size of the image what Google use for Gmail background and then crop your image in same size of it and then upload it. I thing it should work. Look at this. The size of Gmail background image looks to be 2048x1365. resize your images to this size and they should fit exactly. Good luck. Let me know if it works. It appears your initial observation is correct — or at least it is in my case — that Gmail simply does its own cropping to a particular size. FWIW, I did manage to find a few wallpapers I have that still look pretty good in Gmail's cropped version, so I can live with that for the time being. hello everyone, got problem with my custom background images. I really want to get rid of the photos from the "My Photos" tab. the question is how can i delete those photos? I really need help please. Where is 'My Photos' tab? I think your tab is from Google Plus photos. You can change the sharing between Google plus photos and posts to Gmail.